Starter kit orders over $100 include 5 free cartridges. Disposable e-cig orders over $100 include 1 free disposable e-cig. You only need to enter the code at checkout! Not applicable towards previous purchases. No exceptions whatsoever. Free cartridges will be of the same nicotine level as your order in a variety of flavors. Specific flavor requests cannot not be made. Product costs must be over $100.00 including the coupon and do not include shipping costs. 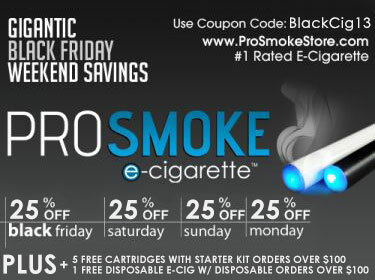 ProSmoke Electronic Cigarettes Offers 25% off EVERYTHING for Black Friday and Cyber Monday and Free Gifts with every purchase over $100! Save big on #1-rated ProSmoke e-cigarettes all weekend long from Black Friday to Cyber Monday, with the biggest savings available all year. Awarded Platinum Level approval by the Green Business Bureau as the only Certified Green American Business in the industry, ProSmoke Electronic Cigarettes’ advanced design produces the most vapor of any mini cigarette on the market, lasts the longest, and tastes the best. Unlike other electronic cigarette systems, ProSmoke’s replacement flavored cartridges use a vegetable based solution (VG) solution that gives off more vapor and is less harsh on the throat. ProSmoke has many great accessories for their e-cigarettes. Choose from car chargers to ProSmoke portable charging cases that charge cigarettes on the go without annoying wires, allowing for easy storage of all your personal smoking accoutrements. All November long Prosmoke will be taking $15.00 off all starter kit purchases over $100.00 with coupon code BlackNov3, or $5.00 off all cartridges, disposables, and accessories over $50.00 using the code BlackNov4. Other offered discounts include 15% off all starter kit purchases using coupon code BlackNov1, or receive 10% off all cartridges, disposables and accessories if you use the code BlackNov2. Also, 25% will be offered off of all purchases from Black Friday through Cyber Monday will be using the code BlackCig13. Additionally, ProSmoke will give 5 free cartridges with any $100 regular E-cigarette purchase or, with any $100 disposable E-cigarette purchases you will receive an additional disposable E-cigarette free. Shop now to take advantage of these amazing savings. ProSmoke Electronic Cigarettes, found online at ProSmokeStore.com, is a United States-based electronic cigarette store established by a unique team of researchers, developers and business experts. Headquartered in Chicago, their team has utilized their extensive experience in the industry to innovate and provide their award-winning electronic cigarettes, cartridges, and e-cigarette starter kit options that continue to set the standard for the industry. Please note coupons cannot be applied towards previous purchases. No exceptions. ProSmoke Electronic Cigarettes, found online at ProSmokeStore.com, is a United States-based electronic cigarette company established by a unique team of researchers, developers and business experts. Headquartered in Chicago, their team has utilized their extensive experience in the industry to innovate and provide their award-winning electronic cigarettes, cartridges, and e-cigarette starter kit options that continue to set the standard for the industry.